A KC-97G refuels a F-4 Phantom. The high deck angle of the F-4 is indicative of the low refueling speed. During Operation Creek Party (out of Rhain MAin AB). The Recon Rhino shows the tailcode of Zweibrücken Air Base, Germany. RF-4C 68-0556 was w/o 8 June 1983 while based at RAF Alconbury U.K. The 126 ARS operated KC-97F from August 1961 and the KC-97L from March 1965. They went to KC-135A in December 1977. The photo above was taken in either 1970 or 1971. The RF-4C was assigned to the 17TRS at Zweibrucken AB, Germany. I joined that unit in Feb 1972 and have flown aircraft 68-556 pictured above. 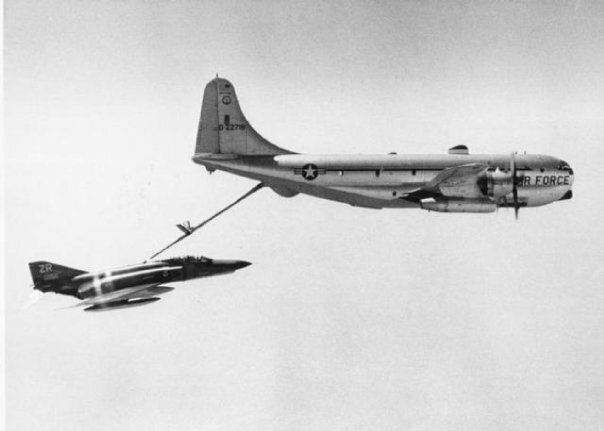 Contrary to some published reports, it was not difficult to refuel an F/RF-4 behind a KC-97. At least with the L models (additional jet engines), it was fairly easy to adapt to their refueling speeds. Often overlooked was the fact the KC-97 refueled at lower altitudes than a KC-135 which actually made it easier for the receiver. The F-4 did not especially like high altitude and high weights. My unit at Zweibrucken normally refueled over Florennes, Belgium, over the North Sea north of the Netherlands, (Dottie Track) or over the Ramstein/Zwei area (Baumholder Track). If in Baumholder we could talk to the tanker as we taxied out for take-off. The Refueling tracks were relatively small, about a 30 mile race track. Refueling altitudes were in the 17-20,000 foot range. It was common to fly to the track and within one pass visually spot the tanker, making rejoin easy. 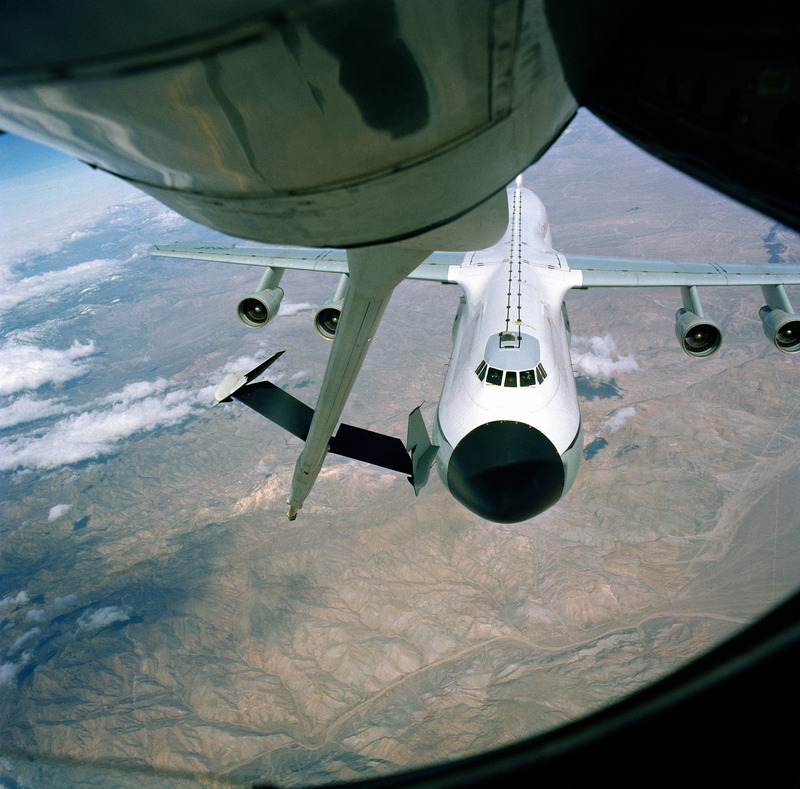 The KC-97 orbited at 190 knots and accelerated to 230 knot for refueling. I have never heard of an F-4 needing the tanker to descend to maintain speed or of an F-4 stalling during refueling. With a little practice, it was easy to top-off your tanks. The KC-97 was normally scheduled to offload 32,000 pounds. Standard profile for us was to schedule at least four receivers with a maximum of eight. An added benefit was the experience of the ANG crews. We regularly saw units from Wisconsin (pictured above), Tennessee, Texas, and Ohio. Almost without exception they were highly experienced. Refueling with the flying boom placed as much emphasis on the Boomer as the receiving pilot. In my experience the ANG had superior boomers over SAC. They were a pleasure to work with. A question on the use of Probe/Drogue use on naval F-4s: In the pictures here all the Phantoms use the boom to get fuel. Is this system changed to Probe/Drogue in naval F-4s? The naval version use probe and drogue as opposed to the boom/receptacle method on Air Force F-4s. They do not have both systems. As far as I know, the F-105 is the only plane that had both systems on the same aircraft.